When you are dealing with a medical issue in your flock, your first reaction shouldn't be to check an online forum or Facebook page, to google the symptoms or read a few blogs. You'll find that limping can be a simple sprain or a sign of the dreaded Mareks disease. A weird egg can be a one-time glitch or infectious bronchitis. Your hen suddenly stopped laying? She could be egg-bound (potentially fatal), molting (totally normal) or just taking a break. Chicken symptoms are incredibly difficult to pinpoint to one cause, and even qualified vets hesitate to give medical advice online, so you should be extremely wary of a blogger or Facebook page that will. So if you have a medical question, your first reaction should be to find a professionally qualified vet who knows how to treat chickens. Chickens are notorious for hiding symptoms and often by the time you even notice anything wrong, the illness can be fairly far along. Chicken health is complicated and even many vets who treat fancy indoor birds don't feel comfortable treating chickens. I get asked medical questions by readers on a daily basis. Much as I want to help, and it's heartbreaking not to be able to, I don't even begin to try to diagnose anyone's chicken. I'm not medically trained, and much as I've read and learned over the years, making an online diagnosis is something I just won't do. But there are people out there who ARE chicken experts. And they're right in your state, or just a click or phone call away. Your can start with searching for Poultry Extension services and University Poultry Science Departments. Sites that end with an .edu, .gov or .org? I suggest bookmarking this post so you have the following links to avian vets, labs, universities and extension services at your fingertips when you need them. Many offer free, or low cost, advice, treatment and necropsies. They can advise you of the laws regarding raising chickens in your area, the latest information on things like the avian flu and also direct you to other reputable resources. This is also an excellent list from Metzer Farms of poultry diagnostic labs by state. They all employ avian vets and are able answer questions about sick or dead birds and to perform necropsies on recently deceased chickens. Phone numbers are provided, as well as broad guidelines as to handling and shipping. Death in our flocks is not a topic we generally want to think about, but this list should be kept handy...just in case. 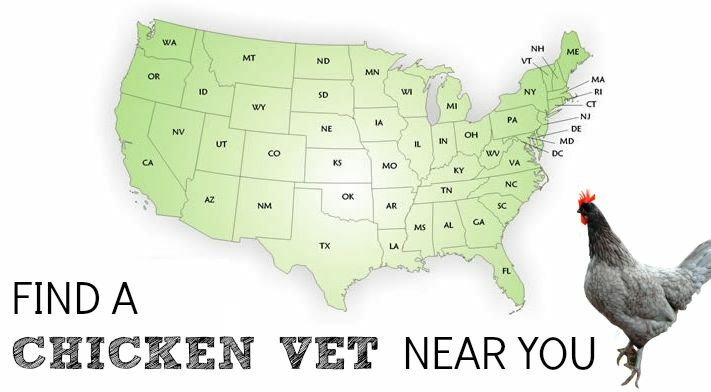 If you are fortunate enough to have a chicken vet close by who will see your chickens, you're in luck. Keep their phone number handy. Either way, I highly recommend stocking a first aid kit for your chickens, working hard at building your chickens immune systems so they are equipped to keep themselves as healthy as possible, and check out this USDA APHIS site which includes the latest Avian Flu updates. Here's more on finding a qualified resource in your area from How to do Things 101 - With Chickens: Internet Vet Advice.